Address to pop into your device: 32 Waihoanga Rd, Otaki 5582.. but beware, you may well lose phone signal along the Otaki Gorge Road so make sure that the destination is loaded before you turn off the main road and save the below image/instructions to your device! Waihoanga directions (PDF) – download me! Waihoanga directions (JPG) – save me to your phone! The Otaki Gorge Road is accessible from State Highway 1, about half way between Wellington to Palmerston North. If heading from the North: drive through Otaki township and cross over the Otaki River. The Otaki Gorge Road is the first on your left. If heading from Wellington, there are three roads that will all take you to the Otaki Gorge Road. The first of these is immediately on your right after the sign to Te Horo. However, if you miss the first two (! 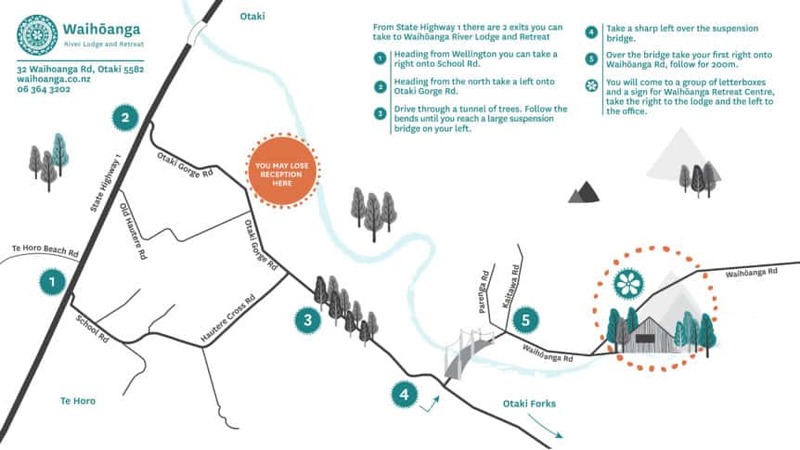 ), you can always join the Otaki Gorge Road immediately before the Otaki township. Take the first right after the bridge. This is Waihoanga Road. 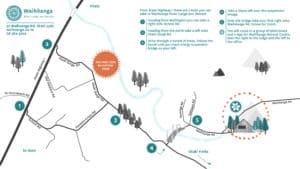 Follow Waihoanga road for about 200 metres until you come to a group of letterboxes on your right hand side and a sign saying Waihōanga Retreat Centre. Take the right hand track, signposted to the lodge.